A comprehensive converged solution for voice and data, with zero-touch deployment. The OXO Connect is the cornerstone of Alcatel Lucent’s small-to- medium business (SMB) offering. Quick to install, easy to use and maintain, the OXO Connect supports next-generation applications and services and grows with the organisation, all the while increasing employee efficiency and improving customer satisfaction. The OXO Connect platforms cover SMB communications needs for companies from 5 to 300 users. 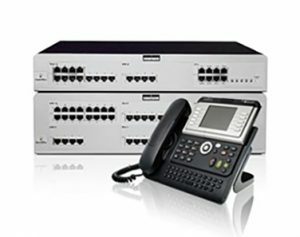 OXO Connect servers combine a VoIP core with support for digital technology and is backed by a broad portfolio of compatible Alcatel-Lucent products for SMBs. With one-number service on several devices, users benefit from consistent communications features and services on Premium Desk Phones and on desktop and mobile applications: unified call log, instant messaging and three-party conference. This feature consistency across devices and applications helps ensure business continuity. A complete range of wired/wireless phones. Enhanced off-site mobility to keep users connected anytime, anywhere. Efficient desktops to increase productivity. Customer welcome from simple voice mail to integrated call routing, providing a professional greeting and increasing customer satisfaction. Single network infrastructure for voice and data services, which reduces costs. Modular, flexible and scalable to meet the needs of SMBs from 5 to 300 users. Offers next-generation enterprise communication experience on PC, desk phones, smartphones. Provides full-featured access to enterprise communications services across devices, on or off site. Increases communication efficiency for employees, offering new opportunities to reach contacts. Increases customer satisfaction by improving call resolution with embedded voice-centric customer service. Reduces communication costs and enables a choice of IP and/or TDM network configurations and IP and/or TDM endpoints, minimising additional investment and enabling a smooth migration thanks to IP telephony infrastructure flexibility and software scalability. Reduces total cost of ownership for business communication and conversation services with simplified and unified management. Easy installation in full voice environment and/or converged voice/data environment at reduced cost with plug-and- play and zero-touch deployment. Optimised installation ready for next generation of communications with Session Initiation Protocol (SIP) at the core. All platforms are equipped with a high-performance Power CPU Extended Edition with integrated MSDB 8-GB memory card and up to 48 VoIP channels. Built-in hotel application. Personal assistant and Instant Messaging. Integrated computer-telephone integration (CTI) server. Ten minutes customised hold music. Voicemail and user mailbox greeting with two ports and 60 minutes of voicemail storage. 200 PIMphony basic user licenses for telephony. Call forwarding: automatic transfer of incoming calls. Supports analog, digital, IP and mobile phones and PC softphones. Call Centre, Automated Attendant (AA), Multiple AA (MLAA) and SIP and CTI openness and SIP trunking.